GenesysIGNITE is an annual event that seeks to congregate startups from all parts of the south-east and south-south region of Nigeria. Its main objective is to discuss latest technology trends as they affect the region, and to proffer professional insights to the participating startups. 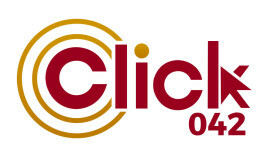 The event will also promote innovative business solutions and ideas by startups within the region. Participating startups will be exposed to potential investors during the event. Graduates and undergraduates will have the opportunity to pitch their startup ideas to a panel. The top three innovative ventures will be granted a seed fund of USD10, 000.00 (ten thousand US Dollars) each. – The Office of the Vice President- responsible for Innovation & Entrepreneurship, and the Federal Minister of Science & Technology. Venue: Office Complex, Tenece Group, Enugu Lifestyle and Golf City- The Centenary city. 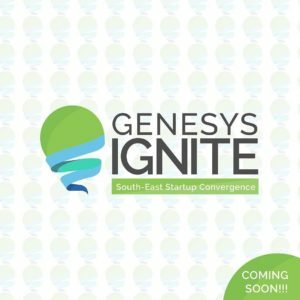 GenesysIgnite is presented by Genesys Technology Hub, an initiative of Tenece Professional Services Limited. 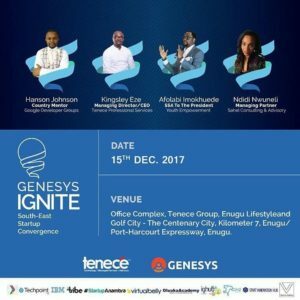 Genesys Technology Hub is an ideas, creativity and knowledge-based platform designed to drive innovation, productivity and economic output in Nigeria with their base in the southeastern region.  An enabling environment for startups in the tech industry, to expand their horizons and gain access to markets and resources that would otherwise be out of their reach. 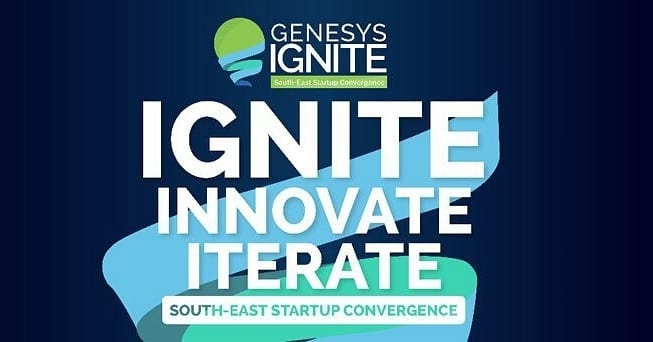 In the past three years, Genesys has been building capacity for training young tech enthusiasts in the southeast, as well as supporting young entrepreneurs with tech based business ideas. In this regard, they have graduated over 150 young tech enthusiasts and incubated over 8 startups in Enugu. 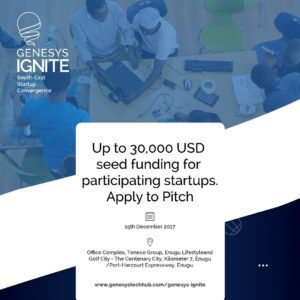 Their recent activities have gained a lot of attention, as Genesys Tech Hub was shortlisted by the Federal Ministry of Industry, Trade and Investment as a possible recipient of US$1million grant to support Techpreneurs, under the World Bank sponsored Growth and Employment (GEM) Project. They also recently visited Berlin to initiate strategic collaborations with successful Tech Hubs in Germany. Furthermore, they are convinced that Enugu state is positioned and has the key ingredients (cosmopolitan nature, large number of tertiary institutions, huge population of youths, access to private capital, etc.) to build a viable Tech Ecosystem, similar to the Silicon Valley of the United States. Their ultimate objective is to build a sustainable and effective model that would exponentially drive economic productivity in the region and Nigeria as a whole; through youth development. Register here to attend GenesysIgnite.